'Coronation Of David' (Bernice Miller by O. David Niswonger, R. 2001). TB, 35" (89 cm), Midseason bloom and rebloom. Maroon red self; beards yellow gold. Parentage unknown. Cape Iris 1999. Rebloom Reported in: AL, CA, GA, MO, OR, TX, VA; zones 6,7,8 and 9. 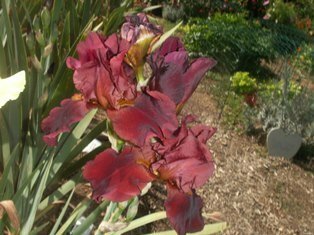 Interested in Tall Bearded Iris? Please visit the: Tall Bearded Iris Society website.